Making cheese at home is one of the joys of a self-sufficient lifestyle, along with gardening, canning, and raising chickens. 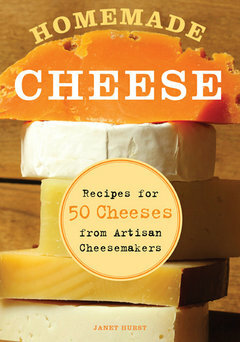 Author Janet Hurst is a 20-year-veteran home cheesemaker, who shows you how to easily craft your own cheddar, feta, chèvre, mozzarella, and 50 more cheeses. Included are profiles of 20 artisan cheesemakers — from Cypress Grove, Vermont Butter and Cheese, Shelburne Farms, Does Leap, Pure Luck, and more — and their favorite recipes.